Entre-Textes introduces advanced students of French to the richness of the Francophone world through literature from the Middle Ages to the 21st century. The course anthology is divided into fourteen modules, each of which pairs a classical text with a modern one. Students are guided to read works from different periods of time and cultural origin and consider how these echo, complement or question each other. Through comparing and contrasting the texts, students will develop a new approach to reading literature while simultaneously reinforcing linguistic and cultural competencies. 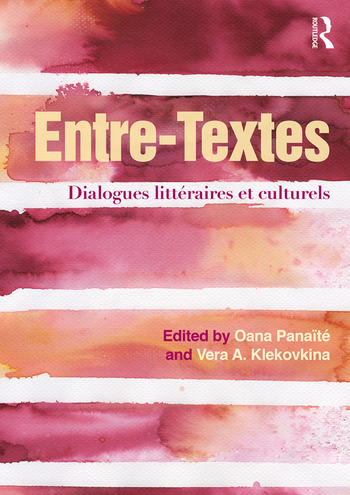 Suitable for advanced students of French and featuring texts from across the French-speaking world, Entre-Textes is an innovative course anthology with a flexible structure and versatile methodology. Oana Panaïté is Associate Professor of French at Indiana University–Bloomington, USA. Vera A. Klekovkina is Associate Professor of French at the University of Wisconsin–Stevens Point, USA.